My husband, Evan, and I live in an apartment in Lincoln Square, a great neighborhood a few miles north of downtown Chicago. The streets are tree-lined, and compared to the hustle and bustle of downtown, it’s very peaceful and quiet. Our third floor windows look out into tall, aged maple trees, which make our home feel like a tree house during the summer. Sounds great, right? The one thing we’re missing is an outdoor space. We have a small landing out back, but no real patio or deck to enjoy the warm summer evenings. The biggest drawback is that we have nowhere to put our beloved grill, which currently resides up the street at our old apartment, getting plenty of love from our friends, Caitlin and Keith. They’re wonderful hosts who have us over often to grill and enjoy their lovely back porch (which we shared before leaving the building four years ago). This was the case a couple weeks ago when we were over for a cookout with a group of friends. What to make, what to make?!? I remembered coming across this old favorite last week when I was searching for the recipe from last weeks hummus post. Perfect! As you can see above, you’ll only need a few ingredients for this dish. However, this recipe does require a little TLC. You won’t be disappointed, though, and neither will your guests! Start by thawing 2 sheets of puff pastry. Preheat your oven to 400 degrees. Cut an avocado in half, removing the pit. Use a spoon to scoop out the soft flesh and transfer to a medium mixing bowl. 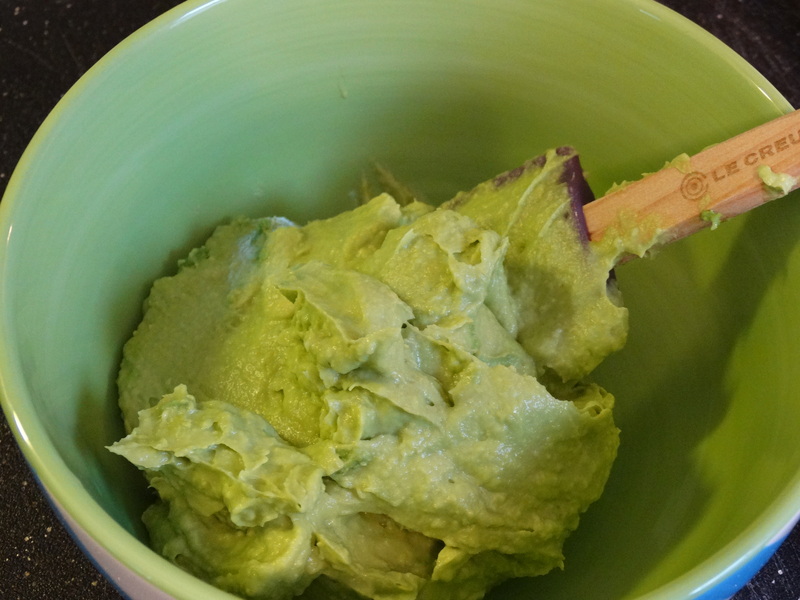 Using a fork or potato masher, mash the avocado until smooth. A few small lumps are okay. 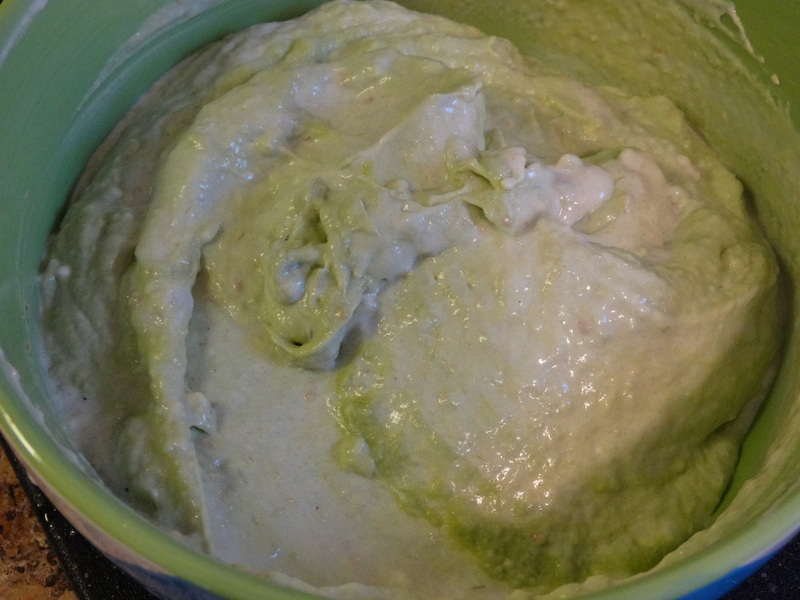 Next add 1/3 cup softened cream cheese and 1/3 cup salsa verde to a small food processor or blender. Mix until combined. Fold the cream cheese/salsa mixture into the mashed avocado. 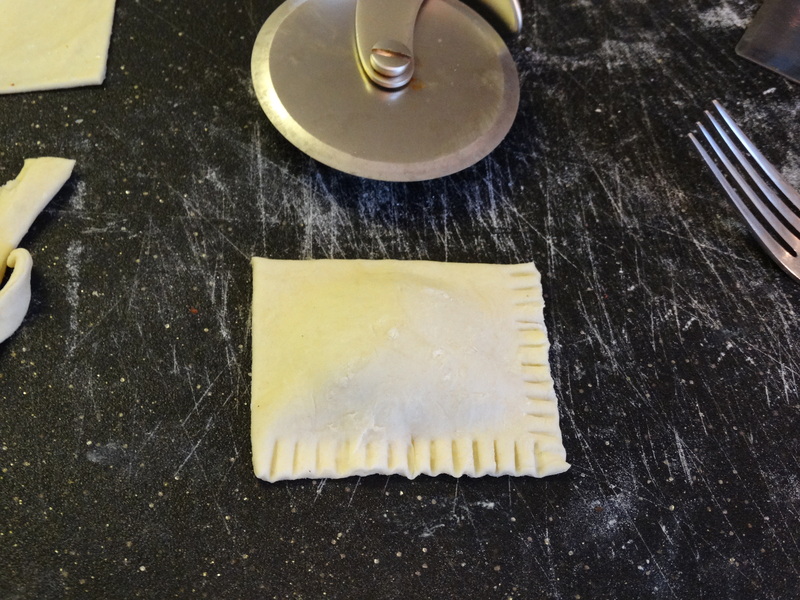 When your puff pastry is thawed, unfold one sheet onto a flour covered surface. Use a rolling pin (if you don’t have one, a wine bottle works just fine) to make the sheet as thin as possible while maintaining its rectangular shape. 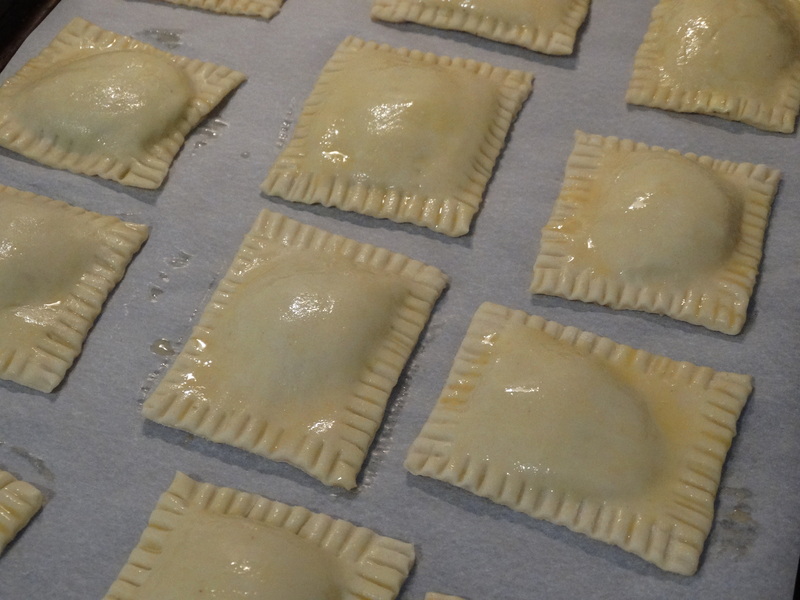 Using a sharp knife or pizza cutter, cut the puff pastry into an even number of squares or rectangles, approximately 4″ square. 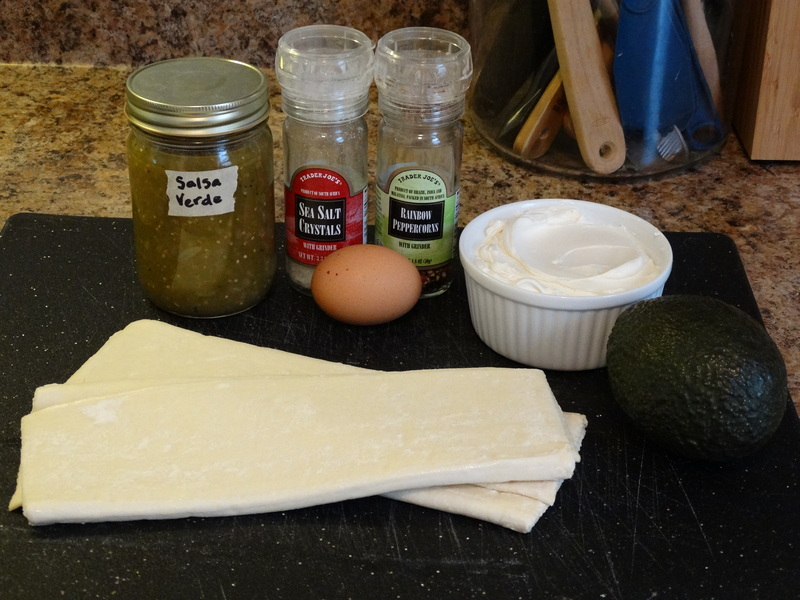 Add a dollop of the avocado mixture onto every other pastry square. Top it with a sprinkle of freshly ground pepper and salt. 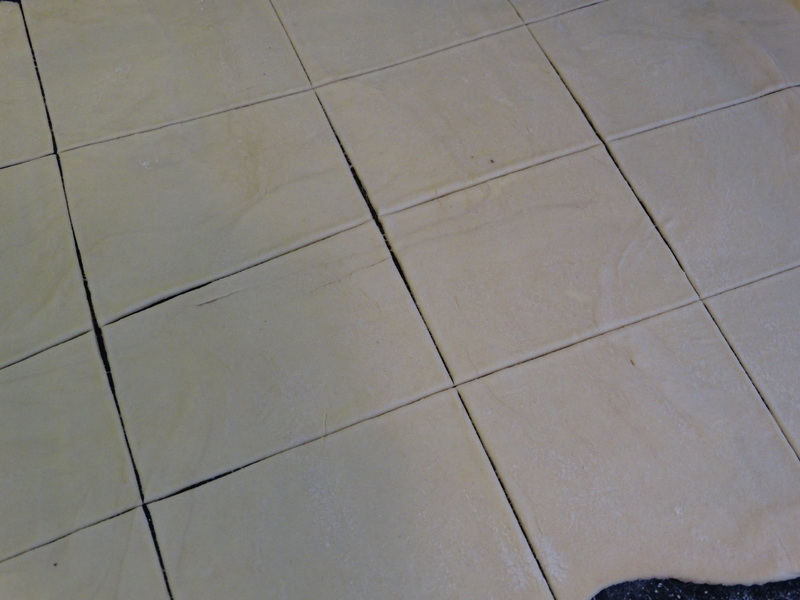 Top each of the mixture-covered pastry squares with an empty pastry square. 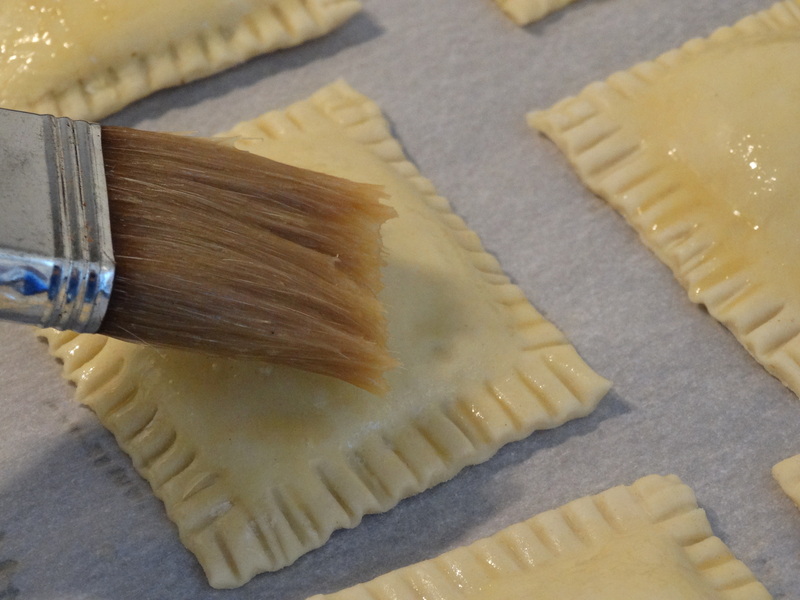 Use your knife or pizza cutter to trim the ragged edges off all four sides of your puff pastry. Not only does this create a nice, clean looking puff, it also seals the edges a bit. Press the edges using a fork to further seal them before baking. Place each sealed puff onto a baking sheet lined with parchment paper (as many puffs as will fit comfortably — keeping in mind that they’ll expand a bit while baking). Beat one egg and brush a small amount on each puff to give them a nice golden top during baking. Bake for 15-20 minutes, or until nicely browned. Remove from oven and cool slightly on a wire rack. Repeat the process with the remaining sheet of puff pastry until gone. You can serve them with a bit of salsa verde if you would like. But even on their own, they’re simply to die for! Enjoy! 2) Cut one avocado in half, removing the pit. Transfer the soft flesh to a medium mixing bowl using a spoon. 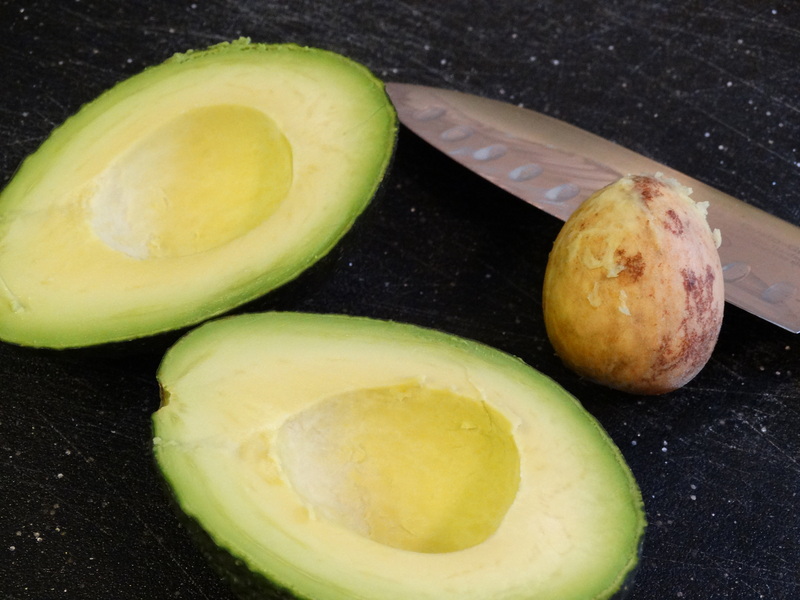 Use a fork or potato masher to mash the avocado until smooth. 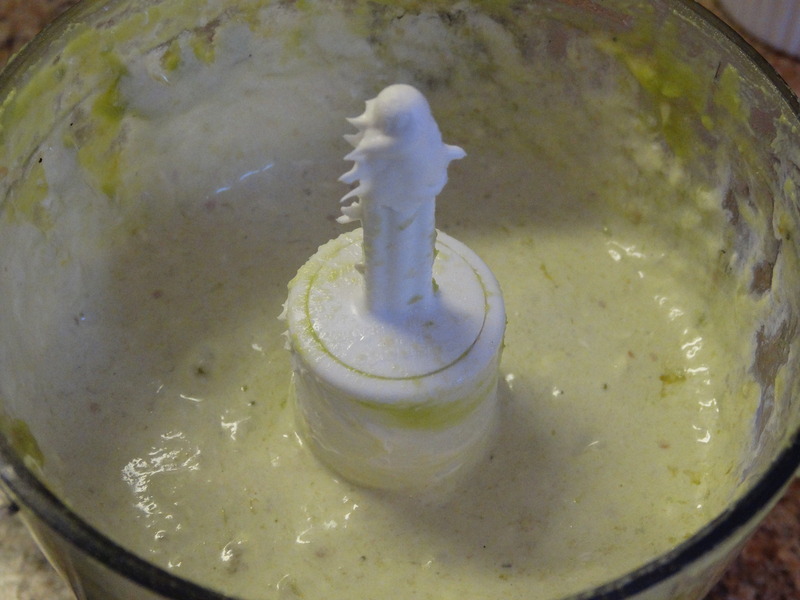 3) In a small food processor or blender, combine 1/3 cup softened cream cheese and 1/3 cup salsa verde. Add this mixture to your mixing bowl and fold in the mashed avocado. 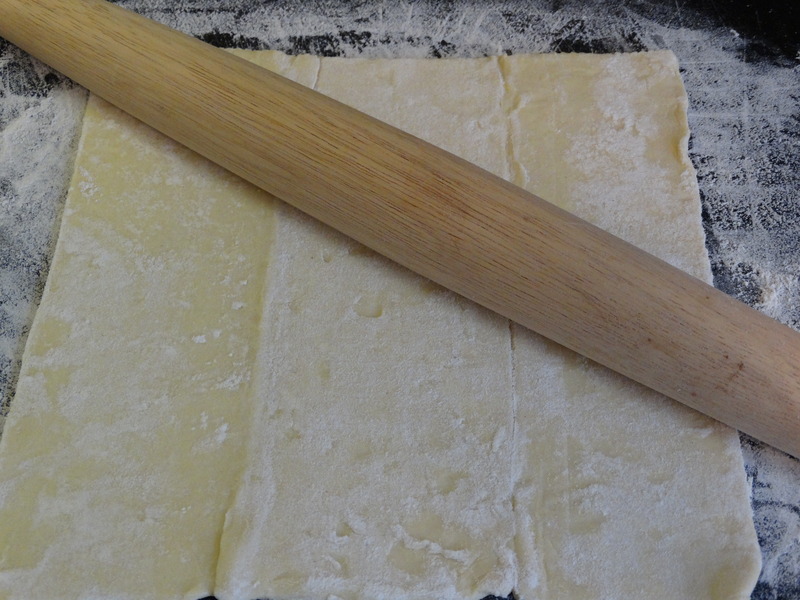 4) Place one unfolded sheet of puff pastry on a floured surface, using a rolling pin to make as thin as possible while retaining the rectangular shape. Cut the sheet into an equal number of squares or rectangles (approximately 4″ square) using a knife or pizza cutter. 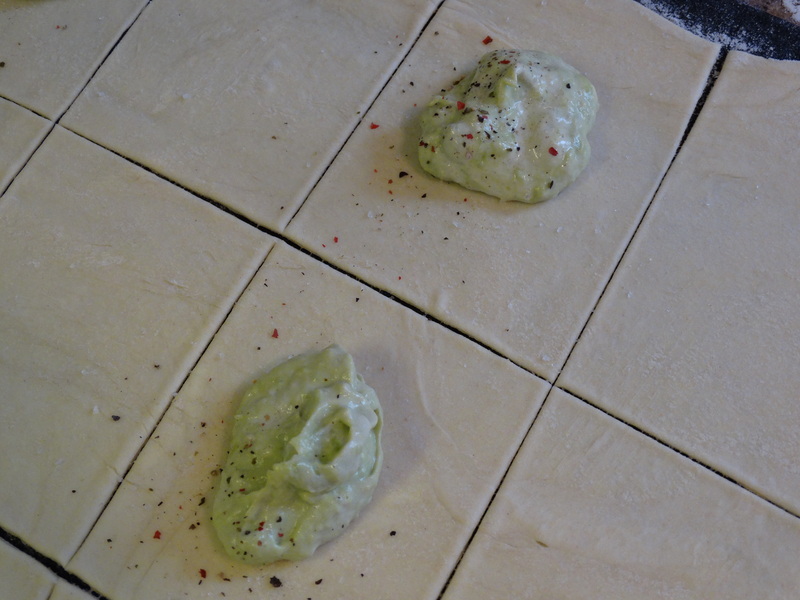 5) Add a dollop of the avocado mixture to every other pastry square and sprinkle with freshly ground pepper and salt to taste. 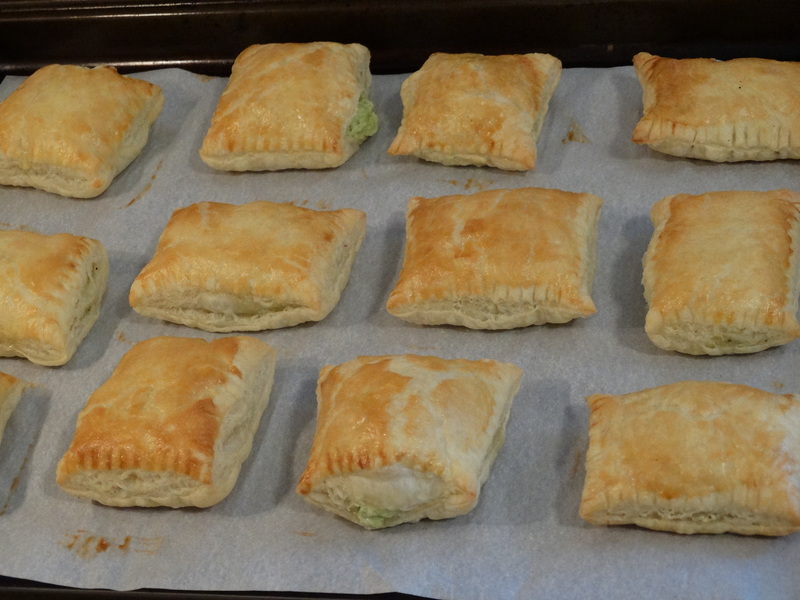 Top each with an empty pastry square. Use your knife or pizza cutter to clean up the edges. Press all four edges with a fork, creating a decorative seal. Place each puff onto a baking sheet covered with parchment paper. 6) Brush each puff with a bit of beaten egg. Bake for 15-20 minutes or until nicely browned. Transfer baked puffs to a wire rack to cool. 7) Repeat the baking process until you run out of puff pastry dough. Serve on their own or with a side of salsa verde. Enjoy! These look SO amazing! I’ve never even thought or heard of doing this before, love it! These look and sound so delicious! Never heard of them – must try!! Thank you for sharing! Pass a napkin…I’m drooling everywhere!